It's my pleasure to welcome the amazing Paulette Harper to the New Voices In Print literary stage. As a sought after motivational speaker, certified life coach, minister and author, Paulette Harper desires to motivate women to reach their God given potential through conferences, workshops and seminars. Combining enthusiasm with an energetic speaking style, audiences describe Paulette’s presentation as inspiriting, enriching and encouraging. As an author and writing coach, Paulette is the visionary behind “Write Now - Releasing the Word In You - literary workshops designed to coach aspiring writers in the areas of creativity, development and publication of Christian books. Paulette’s debut book That Was Then, This Is Now: This Broken Vessel Restored, has achieved national recognition, as a finalist in the 2009 Next Generation Indie Book Award. Moreover, it ranked consecutively on the Black Christian Publishers Bestsellers List for Independent Publishers (non-fiction category). Her newest release Completely Whole was published under her own publishing company Thy Word Publishing. It's my pleasure to interview Paulette and give readers the opportunity to learn about this talented woman of God. More than just another generic self-help offering, Completely Whole features thoughtful meditations, powerful prayers, and timely scriptural passages, all designed to present the reader with a detailed, comprehensive understanding of what it takes to achieve a truly fulfilling life. In so doing, the readers will undergo a fully transformative change – mind, body, and spirit – that will ultimately lead them to the lives of peace and satisfaction they’ve been seeking for so long. 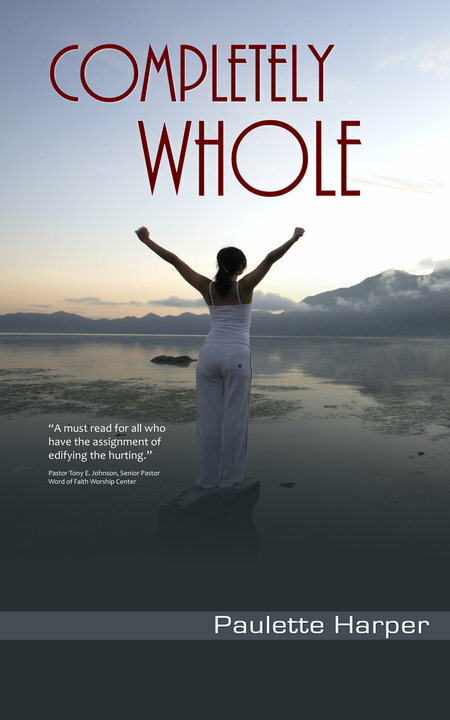 Completely Whole is an inspirational guide to living a healthier spiritual life. What was your inspiration for writing your novel/book? I believe that decision was already made for me by my Heavenly Father. My personal experiences in life actually drew me into this profession. Seeing others empowered through my writings confirms that this is actually what I’m supposed to be doing. Who have you written your book for and why did you target this audience? I enjoy writing books that empower and enriches the lives of every believer. My audience is those who are searching for a more fulfilled life with Christ. What do you want your readers to take away from your /book? I’d like the reader to come away with knowing that there is a solution to their problem. Completely Whole offers the reader prayers and scriptures that will help them on their journey towards wholeness. What was the most rewarding part of writing your novel? The most rewarding part of writing Completely Whole was when I finished the last chapter. Realizing that God allowed me to write another book was absolutely amazing. I feel this is what I’m called to do. I have a passion to write quality books that will have an eternal affect on the lives of the reader. I write because I have hear the testimonies of those that read my books… those testimonies are encouraging me to continue on this path. My story is different from many writers; I didn’t grow up with the aspiration to become a professional writer. On the contrary, I just wanted to get married, have children, and do the work of God. When God spoke to my heart about writing, I knew He wanted me to write inspirational booksbooks that encouraged, motivated and led readers toward a closer walk with Him. With that being my vision, my writing career began. On May 24, 2008, my first non-fiction inspirational book That Was Then, This Is Now: This Broken Vessel Restored was released. On Nov 4, 2009, I was honored to be selected to participate in my first anthology, Victorious Living for Women. Victorious Living for Women is filled with the inspiration, wisdom and pathways to victory of 40 incredible women who share intimate stories of their lives, from their hearts to yours. What is the biggest lesson you’ve learned since becoming an author? One of the biggest lessons I’ve learned is that there are cliques in certain circles and if you don’t fit in that particular genre they won’t recognize you. If you could spend an hour talking with any author, living or dead, who would it be and why? 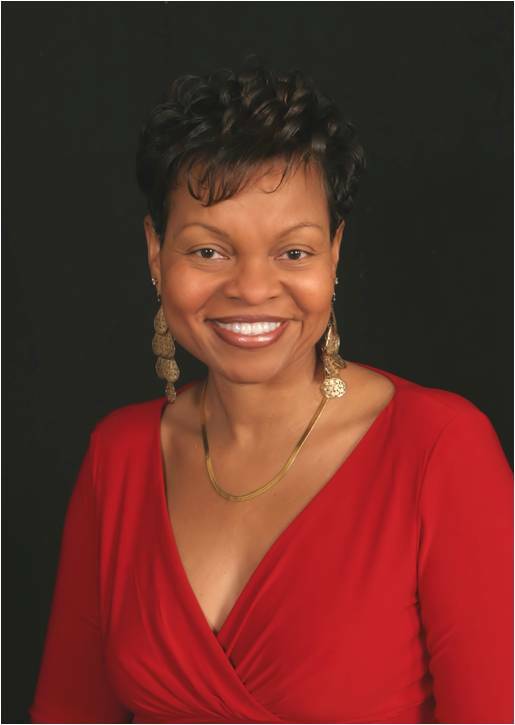 Dr. Maya Angelo. Dr. Maya Angelou is one of the most renowned and influential voices of our time. She is such a remarkable person who has touched the lives of countless thousands. I would love to sit and glean from her years of wisdom and be taught from someone of her caliber. What novel/book has had the greatest impact on your life? The bible. It teaches me how to live my best life now. What is the most encouraging advice you’ve received as an author? One piece of advice has been to keep enhancing and developing my skills as a writer by attending workshops and conferences. What is one tip you would give to aspiring authors? Set a time and place to write daily. Determine when you are the most creative and inspired to write. For many people, the morning is a good time to write. Find a comfortable place to write. Have everything you need within reach. What new projects can readers expect from you? I’m currently working on two projects for 2011. Victorious Living for Moms, my second anthology, is slated for release in May 2011, right in time for Mother’s Day and the release of my forth book, For Such a Time as This. What, When, and Where is your next literary event? I will be having my book release party for Completely Whole on Friday, Sept 24 in Bradenton, Florida at Word of Faith Worship Center. What can aspiring writers do to get in touch with you about your Write Now workshops? I would encourage those who are seeking to get published… go for it! Even if you desire to have a major publishing house offer you a deal and they do not, don’t loose heart, publish it yourself. What ever you decide to do, understand this that you will have to do most of the marketing. 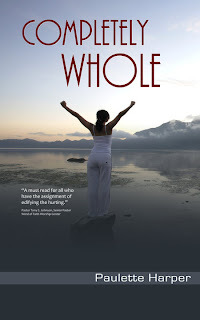 To contact Paulette and to purchase a copy of Completely Whole visit her website: http://www.pauletteharper.com/. 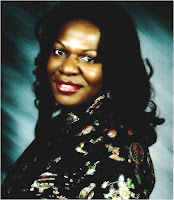 You can also connect with her on Facebook under Paulette Harper-Johnson and on her blog Empowered to Proper. http://www.pauletteharper.blogspot.com/. Melissa Ann Ricks is a woman of faith and purpose. A spiritual writer who writes from the heart. M. Ann (according to her professional title) is a wife and mom who lives and walks by faith as she seeks to please God and be His voice to the world. Melissa is a graduate of Rider University and lives in Bear, Delaware with her loving husband and two handsome sons. She has three books to her credit, her debut novel, Awesome Wonder, The Son and the recently completed THE BLOOD DONE SIGNED MY NAME. Please take a few minutes and see what Melissa is all about. How would you describe your novel? The Son centers itself on Daniel Manders and the Manders family. Since childhood, he has always been the one that was admired and called upon to do the right thing especially when it involved rectifying a situation for his family, specifically his brothers. Daniel Manders is considered the "chosen one” and is inwardly cognizant of this gift but decides that he doesn’t want the responsibility. Choosing to leave home to escape his family, he lived his life without worrying about rescuing his family from themselves. Daniel soon finds himself in a situation that only the Lord can get him out of. While trying to reassemble the puzzle that he calls his family, Daniel's purpose becomes clear but God's desire and destiny for his family is challenged. What was your inspiration for writing your novel? It was impressed on my heart that there are so many people that know who God is but are either afraid of being who God has called them to be or don’t think that they can handle the responsibility of being a true and uncompromising child of the Most High God. We sometimes let our fear, our families and relationships keep us from the future that God has destined for us. God has gifted so many of us, with the intelligence and the “know-how” to do so many awesome things. Men, as it relates the novel, are born leaders, they simply have to acknowledge it, stop running from who they are and stop trying to take the easy way out. The path may not be easy nor is it always convenient but if we seek Him first, everything else will be added. What do you want your readers to take away from your novel? What did you find most challenging as you wrote your novel and how did you overcome this challenge? Writing from a male point of view was a challenge. Making Daniel, a man, the protagonist was new and uncharted waters. At times I felt unsure about being able to effectively communicate from that perspective. I simply asked God to take over and because He is faithful, He did. The words and masculine sentiment were conveyed in exactly the way I prayed they would be and the message was received. Finish this statement: I became a writer because creating and sharing stories of faith, His unconditional and unending love will change lives and provide spiritual revelation. I believe this will augment the Kingdom of God. I also believe this is what God has purposed for my life and I am determined to walk in my purpose! It seems inwardly, I knew that I was not destined to be a “corporate woman” and when my position was eliminated throughout the entire organization. I had an inkling that it was God-ordained, at least for me. I’d always loved to write and as my relationship God became stronger, my desire to write become stronger and strangely, to my surprise, a need. My yearning to please Him with the stories that I created increased. I realized that this could be my way of bringing souls into the Kingdom of God. “Tell the world about Me with the words I will give you,” is what I heard. Admittedly, I used my occupation, (or lack thereof) as an excuse and had mixed emotions as to my next steps. After seeking the Lord and requesting and then receiving the needed confirmation, (two or three confirmations to be truthful), I finally arrived at the conclusion that writing was the path that God has placed me on. Believing that God would give me the words, I began to write my first book; Awesome Wonder: The Gift of Remembrance. My husband said something that enables me to write with confidence; “If God told you to write, then write, and stand on His promises.” After four months of searching for a publisher, God blessed me with an opportunity and the rest will certainly be “His-story”! I had to learn that everyone doesn’t have your best interests at heart. Many are in this industry, even Christian Fiction, (sad to say) to make a buck; plain and simple. I know that Paul of Tarsus was inspired by God as God is the true author of the Bible but I would love to sit down and speak with him. He, with aid of the Holy Spirit wrote most of the New Testament, endured mental and physical persecution and still managed to mentor his brothers and sisters in the gospel. I would bombard Him with questions. I know I’ll get the opportunity in Heaven but then it won’t matter because I’ll be too busy hanging out with Jesus. I would love to sit with Paul to hear first-hand about how he received his inspiration to write what thus saith the Lord. What an awesome conversation that would be! Other than the Bible, Church Folk by Michele Andrea Bowen greatly impacted my life. It is a great story but that is not the reason. Michele showed me what I could be. After experiencing her novel, I knew that I could do the same thing. I had no idea what Christian Fiction was… had no idea that the genre of literature was in existence. What a blessing she was. She was used by God to show me my destiny; my purpose. Creating stories with fictional characters that contend with real life issues to communicate the genuine and unfailing love of Jesus Christ while making it abundantly clear that Jesus is the only ANSWER is what I am destined to do… In Jesus’ name. Firstly, one must believe in their gift and talent. Rejection is part of the process but persistence is the key. I have learned that what God has started in me, He is obligated to finish and I will be successful. If He has called you to it… He will see you through it!! As an author, your assignment is to write, God will send people for your life. The other aspects; promotion, marketing, notoriety and money will come. Seek ye first the Kingdom, (seek to do God’s will) and everything else will be added! I have completed my third novel, THE BLOOD DONE SIGNED MY NAME. This novel took me the longest to write and has blessed me immensely. It is seasoned with the sensuality of love, the need for familial truth and deliverance as well as God’s promise of hope and redemption. Feelings of condemnation, guilt and shame are some of the underlying reasons why some won’t accept, believe or even acknowledge the unending love Christ has for us. Because of the past, familial history, generational tendencies or even consistently making choices that proved to be wrong, many have decided to live a defeated life of regrets; resolving that they are worthless. One may visit my website; http://www.mannricks.net/ to purchase Awesome Wonder, my debut novel and The Son. Any novels purchased via my website are autographed by me and shipped directly to you. My novels may also be found and purchased in any literary establishment, Borders, Barnes and Nobles, etc. and may be purchased online; i.e. : Amazon, etc. I consider it an honor and privilege that New Voices in Print would decide to spotlight me and my novel, The Son. This is truly a God-send. Thank You! I thank God for you Melissa… You were whispered into my heart and that is how this came about! God is wonderful! I am confident that my steps are divinely ordered and am assured that God has purposed me to affect lives in a realistic way with messages that will birth “overcomers” in the Earth who will glorify God! Wow, what an amazing testimony on finding your purpose in God. I would encourage everyone ot touch base with Melissa and pick up her books. A blessing awaits you! I am so pleased to introduce fellow writer and new friend, Carla Victoria Wallace and her debut novel, Love Never Fails. Born and raised in Connecticut, Carla Victoria Wallace resides there with her husband. She currently works as an elementary school teacher. Carla enjoys instilling her love for reading and writing into the children that she teaches. When she’s not teaching, she likes to spend her spare time traveling, reading, or working on her latest book. Carla was gracious enough to take time and share her novel and her journey to publication with me. It's my pleasure to give her the spotlight at New Voices In Print! Enjoy!!! 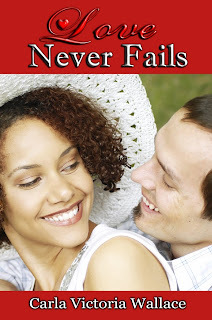 Love Never Fails is an inspirational romance novel. The story focuses around Jada, an African American woman who is being pursued by two different men. One of her pursuers is Mike, an African American man from her childhood, and the other is Pete, the Caucasian brother of her co-worker. This novel explores the internal and external challenges of relationships and dating outside of one’s race. I was inspired by the joys and challenges that come with loving the people in our lives. When a couple gets together, they bring their own backgrounds, experiences, and families into the relationship. This dynamic gave me inspiration for writing this novel. Who have you written this novel for and why did you target this audience? Love Never Fails has characters from diverse ethnic backgrounds, so I believe that it is a multicultural novel. It may especially appeal to readers of interracial romance novels. I targeted the multicultural audience because I believe that Love Never Fails delivers an inspirational message about unity. I want my readers to feel entertained, and inspired to love. For those who are unmarried, I hope that they will be patient and wait for God’s best choice for them before beginning a new relationship. My biggest challenge as I wrote this novel was character development. Trying to communicate the characters’ feelings and emotions didn’t come easily for me at first. There wasn’t much tone or expression in my dialogue. Then my editor gave me the advice of showing what my characters were thinking and feeling through their actions rather than just telling the readers through words. This advice helped me to overcome this challenge by visualizing how a person would act if they were experiencing a particular thought or feeling. By describing body language and facial expressions, I was able to put the characters’ feelings and emotions onto paper and help the characters come alive. I enjoy a good story. In February, 2008 I purchased a novel that had been published by Urban Christian Books. After purchasing the novel, I brought it home and began to browse the Urban Christian website. As I read about the featured books and authors, I began to feel a pressing to write my own novel. I sat at my computer and typed a summary for a novel. Then, I went back to the Urban Christian website and saw that they were accepting manuscripts for fiction books. I began writing chapter one that same day, and by August, 2008, I had finished the entire manuscript. However, when I went back to the Urban Christian website to reread their submission guidelines, I saw that they were no longer accepting unagented submissions. Feeling disappointed, I went back to their author page and saw that Dwan Abrams had started her own publishing company called, Nevaeh Publishing. I prayed over my manuscript and mailed the first three chapters straight to her company. About six weeks later, they requested to see the full manuscript. While I waited for their response, I continued to pray for God’s will over my manuscript. I believed that If God wanted it to be published, he would open the right doors. Three months later, in January 2009, Nevaeh Publishing offered me a contract to publish, Love Never Fails. The biggest lesson I’ve learned since becoming an author is that I have to promote myself. I am kind of shy by nature, so putting myself out there can be challenging for me. As a new author I’ve learned that I have to be willing to talk about my book to everyone I come across. I also have to reach out to other authors, book stores, libraries, and community organizations. I would love to spend an hour talking to Kendra Norman Bellamy. I had the pleasure of meeting her in person at a Book Release party hosted by Genesis Book Club in Connecticut. Although I did not get to spend a lot of time talking with her one on one, I could tell that she has a great spirit, and I love her books. Her stories are full of drama, romance, mystery, and inspirational messages. What novel has had the greatest impact on your life? The novel that had the greatest impact on my life is, Three Fifty-seven A.M. Timing is Everything by Kendra Norman Bellamy and Hank Stewart. When I decided to get back into reading again, that was the first novel that I purchased. It was also the novel that introduced me to Urban Christian Books, which led me onto my publication journey. 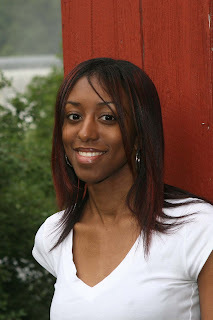 Dwan Abrams, Nevaeh Publishing’s founder is very encouraging. In a conference call with her and the company’s other authors, she said that we wouldn’t be on the roster if we didn’t have good books. That gave me the confidence I needed to get out there and promote myself. I would encourage aspiring authors to seek God in all that they do. I wouldn’t be where I am today without Him. What new projects can readers expect from Carla Victoria Wallace? Readers can expect another novel from me in the near future. I have completed storylines for a romantic suspense and a dramatic suspense novel. My next literary event will be Saturday, March 13, 2010 at Borders Bookstore in Milford, CT. I will be signing copies of Love Never Fails from 2:00pm to 4:00pm. Where can your novel be found? My novel can be purchased through bookstores such as Barnes and Noble, or online at Amazon.com, Barnesandnoble.com, and Nevaehpublishing.com. I really appreciate everyone who took the time to read this interview or purchase my book. If readers would like to contact me, they can visit my website at www.cvwallace.com or www.myspace.com/carlavictoriawallace. I can also be found on Facebook under Carla Victoria Wallace. Thanks so much Carla for letting me share your new voice in print. Everyone, please stop by your local book store and get a copy of Carla's book, Love Never Fails! Be Blessed and keep writing! Welcome to New Voices In Print ~ The place where new Christian authors have a place to stand in the spotlight. As a new author, I realize how challenging it can be to break into the literary world. To help ease this challenge, I've created a place to give debut authors a chance to toot their own horn. I also want to encourage others to use the gifts God gave them to building the kingdom and to bless lives. If you're an up and coming writer with a new book coming out or know someone who is, please drop me a line so the world will know who's out there!